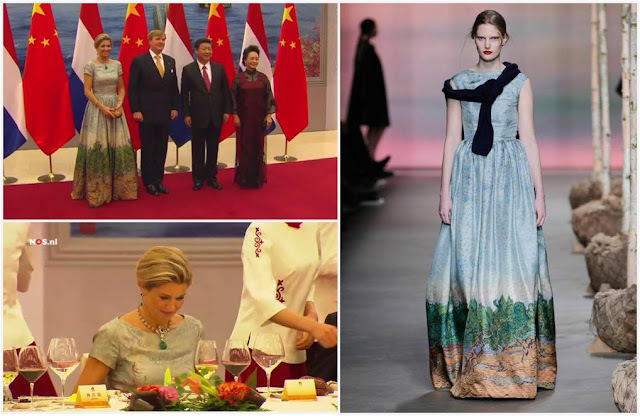 King Willem-Alexander and Queen Máxima were all of one day into their state visit to China before the Queen was forced to call in sick with a kidney infection. Trouper that she is, she did manage to turn up for the state banquet, because what else is she going to do with all those emeralds and a brand new dress? As further proof that Máx knows what she's doing when it comes to state banquets, the Van Gogh print works beautifully as a focal point for the quick posed full-length shot, but it disappears for the table shots (of which there are usually more). She kindly added a second focal point so as not to bore anyone while dining, and nothing says focal point quite like GIANT EMERALDS. Máxima is not only showing off the rocks, Easter egg emerald drop included, she's showing off the flexibility of the family collection and of the Dutch Emerald Parure. This is what she does best, and I love seeing her magpie sense at work.